This is the abstract base class for API formatters. Definition at line 28 of file ApiFormatBase.php. If $format ends with 'fm', pretty-print the output in HTML. Definition at line 40 of file ApiFormatBase.php. Whether this formatter can handle printing API errors. If this returns false, then on API errors the default printer will be instantiated. Definition at line 135 of file ApiFormatBase.php. Finish printing and output buffered data. Definition at line 236 of file ApiFormatBase.php. References ContextSource\$context, $header, $out, $time, FormatJson\ALL_OK, Html\element(), FormatJson\encode(), ApiHelp\fixHelpLinks(), getBuffer(), SkinFactory\getDefaultInstance(), getFormat(), getIsHtml(), getIsWrappedHtml(), ApiBase\getMain(), HttpStatus\getMessage(), getMimeType(), ContextSource\getRequest(), ApiBase\getResult(), SpecialPage\getTitleFor(), MessageLocalizer\msg(), ContextSource\msg(), null, Html\rawElement(), and Hooks\run(). This causes calls to initPrinter() and closePrinter() to be ignored. Definition at line 115 of file ApiFormatBase.php. Ignore request parameters, force a default. Used as a fallback if errors are being thrown. Definition at line 145 of file ApiFormatBase.php. Definition at line 357 of file ApiFormatBase.php. References $ret, getIsHtml(), ApiBase\PARAM_DFLT, and ApiBase\PARAM_HELP_MSG. Get the contents of the buffer. Definition at line 353 of file ApiFormatBase.php. Definition at line 369 of file ApiFormatBase.php. Return a filename for this module's output. If $this->getIsWrappedHtml() || $this->getIsHtml(), you'll very likely want to fall back to this class's version. string Generally this should be "api-result.$ext"
Definition at line 70 of file ApiFormatBase.php. 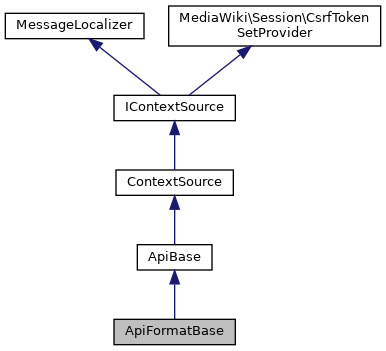 References $ext, MediaWiki\MediaWikiServices\getInstance(), getIsHtml(), getIsWrappedHtml(), and getMimeType(). Get the internal format name. Definition at line 87 of file ApiFormatBase.php. Referenced by closePrinter(), and getExamplesMessages(). Definition at line 376 of file ApiFormatBase.php. Returns true when the HTML pretty-printer should be used. The default implementation assumes that formats ending with 'fm' should be formatted in HTML. Definition at line 97 of file ApiFormatBase.php. Referenced by closePrinter(), ApiFormatXml\execute(), ApiFormatJson\execute(), getAllowedParams(), ApiFormatRaw\getFilename(), getFilename(), initPrinter(), and setHttpStatus(). Returns true when the special wrapped mode is enabled. Definition at line 106 of file ApiFormatBase.php. Referenced by closePrinter(), ApiFormatRaw\getFilename(), getFilename(), and initPrinter(). Overriding class returns the MIME type that should be sent to the client. When getIsHtml() returns true, the return value here is used for syntax highlighting but the client sees text/html. Referenced by __construct(), closePrinter(), getFilename(), and initPrinter(). Overridden to honor $this->forceDefaultParams(), if applicable . Definition at line 154 of file ApiFormatBase.php. Initialize the printer function and prepare the output headers. Definition at line 187 of file ApiFormatBase.php. References $header, $value, ContextSource\getConfig(), getFilename(), getIsHtml(), getIsWrappedHtml(), ApiBase\getMain(), getMimeType(), and null. Whether the printer is disabled. Definition at line 123 of file ApiFormatBase.php. Append text to the output buffer. Definition at line 345 of file ApiFormatBase.php. Referenced by ApiFormatXml\addXslt(), ApiFormatPhp\execute(), ApiFormatXml\execute(), ApiFormatJson\execute(), ApiFormatRaw\execute(), and ApiFormatFeedWrapper\execute(). Set the HTTP status code to be used for the response. Definition at line 171 of file ApiFormatBase.php. References $code, getIsHtml(), and ApiBase\getMain(). Definition at line 30 of file ApiFormatBase.php. Definition at line 33 of file ApiFormatBase.php. Definition at line 29 of file ApiFormatBase.php. Definition at line 32 of file ApiFormatBase.php. Definition at line 31 of file ApiFormatBase.php.